Light was God’s first creation, and God saw that it was good. This goodness, says St. Basil, is a kind of absolute beauty—not the beauty of harmonious proportions, but the beauty of pure joy, much like the beauty of God. “And God saw that the light was good” (Genesis 1:4). How can we praise light enough, after the Creator himself has given testimony to its goodness? Even among us, the word “good” or “beautiful” (the words are the same in Greek) refers to the judgment of the eyes, incapable of raising itself to the idea that the senses have already received. But if beauty in bodies comes from the symmetry of the parts, and the harmonious appearance of the colors, how can we keep this idea of beauty in a simple and uniform essence like light? Wouldn’t the symmetry in light be shown less in its parts than in the pleasure and delight at the sight of it? The beauty of gold is also like this: it owes its beauty not to the happy arrangement of its parts, but only to its beautiful color, which has a charm that attracts the eyes. In the same way, the evening star is the most beautiful of the stars, not because the parts of which it is made form a harmonious whole, but because of the unalloyed and beautiful brightness that meets our eyes. Furthermore, when God proclaimed that the light was good or beautiful, it was not because it was charming to the eye, but because of its future advantages— because at that time there were not yet any eyes to judge its beauty. He was born near Annécy, in Savoy, studied the law, and was ordained to the priesthood despite the opposition of his father. His first mission was to re-evangelize the people of his home district (the Chablais), who had gone over to Calvinism. Always in danger of his life from hostile Calvinists, he preached with such effectiveness that after four years most of the people had returned to the Church. He was then appointed bishop of Geneva, and spent the rest of his life reforming and reorganising the diocese, and in caring for the souls of his people by preaching and spiritual guidance. The pagan philosopher Celsus wrote a tract accusing the Christians of hating reason. Not at all, says Origen (himself a careful and logical thinker). But not everyone can be a philosopher. That simple people should be saved is the most important thing, but Christian philosophers investigate their faith thoroughly. He goes on to tell us that, in taking up opinions, we should follow logic and a logical system, since people who assent to opinions without following that course are very likely to be fooled. And he asserts that people who don’t want to give or take a reason for their belief keep repeating, “Don’t examine, just believe!” and “Your faith will save you!” And he claims that they also say, “Wisdom of this world is bad, but foolishness is good!” To that we answer that, if it were possible for all to give up the business of life and devote themselves to philosophy, no one should follow any other course. (I don’t want to sound arrogant, but in Christianity you’ll find at least as much investigation into beliefs, and explanation of obscurities in the prophets, and of other things that were told or done as symbols.) But since it’s not possible for everyone to be a philosopher—partly because of the necessities of life, and partly because not everyone has the ability, since only a very few seriously devote themselves to study—what better way to help the multitude than the way Jesus did with the heathens? Think of the crowd of believers who have washed away the filth of wickedness they used to wallow in: isn’t it better that they should believe without a reason, and so reform and improve their habits, because they believe that we are punished for our sins and honored for good works? Or would it have been better if they hadn’t allowed themselves to be converted by mere faith, but had waited until they could thoroughly examine the reasons? I just finished reading H. Rider Haggard’s King Solomon’s Mines for a class. In reading many of the definitions of the word and phrases used in the book I came across the word “boss.” It appears to be such an everyday word. Who would have thought it has such a long and interesting history. 1. a person who employs or superintends workers; manager. 2. a politician who controls the party organization, as in a particular district. 3. a person who makes decisions, exercises authority, dominates, etc. : My grandfather was the boss in his family. 4. to be master of or over; manage; direct; control. 5. to order about, especially in an arrogant manner. 7. to be too domineering and authoritative. In collaboration with First 5 San Bernardino, San Bernardino County Children and Family Services, and Children’s Fund, the Children’s Network of San Bernardino County will be hosting The Lisa Project, a fully interactive multisensory experience that will take you beyond the headlines and statistics about child abuse. This audio tour and media exhibit is a journey as experienced through the eyes, ears and emotions of children plagued by abuse. The Lisa Project promises to raise awareness through education as you “take a child by the hand” and listen to their story. This unique and powerful exhibit about child abuse awareness and prevention will be on display at Arrowhead Regional Medical Center (Colton) in January, The Mall of Victor Valley (Victorville) in February, and Victoria Gardens (Rancho Cucamonga) in March 2012. Exhibit entry is free to the public with a suggested parental rating of PG-13: operating hours vary at each location. Please visit www.thelisaproject.org for more information and exhibit times. To schedule a private group tour, please contact Children’s Network of San Bernardino County at 909.383.9677. BALTIMORE (AP) — Edgar Allan Poe fans waited long past a midnight dreary, but it appears annual visits to the writer’s grave in Baltimore by a mysterious figure called the “Poe Toaster” shall occur nevermore. Poe House and Museum Curator Jeff Jerome said early Thursday that die-hard fans waited hours past when the tribute bearer normally arrives. But the “Poe Toaster” was a no-show for a third year in a row, leaving another unanswered question in a mystery worthy of the writer’s legacy. Poe fans had said they would hold one last vigil this year before calling an end to the tradition. 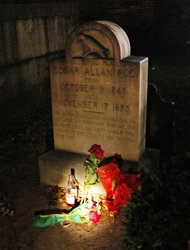 It is thought that the tributes of an anonymous man wearing black clothes with a white scarf and a wide-brimmed hat, who leaves three roses and a half-empty bottle of cognac at Poe’s original grave on the writer’s birthday, date to at least the 1940s. Late Wednesday, a crowd gathered outside the gates of the burial ground surrounding Westminster Hall to watch for the mysterious visitor, yet only three impersonators appeared, Jerome said. 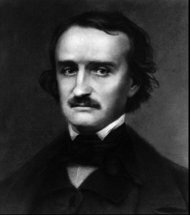 The gothic master’s tales of the macabre still connect with readers more than 200 years after his birth, including his most famous poem, “The Raven,” and short stories such as “The Tell-Tale Heart” and “The Pit and the Pendulum.” Poe’s “The Murders in the Rue Morgue” is considered the first modern detective story. Jerome, who was first exposed to Poe through Vincent Price’s movies, believes people still identify with Poe’s suffering and his lifelong dream to be a poet. He has kept a vigil for the “Poe Toaster” each year since 1978 and built up a team of other dedicated Poe fans who stay awake all night to scan the shadows of the burial ground for the visitor. 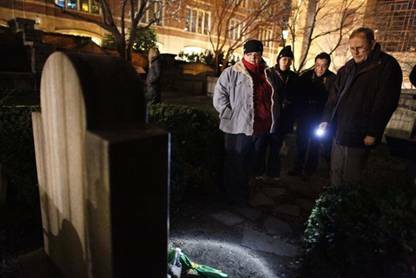 One Poe tradition may have ended, but Jerome said a reading of tributes by Poe fans at the gravesite planned for Thursday night may develop into a new ritual to mark the writer’s birthday. Jerome says that wherever he travels, he’s asked whether the “Poe Toaster” is real. He believes the mystery of the “Poe Toaster” tradition will remain in the public consciousness despite the end of the visits. That mystery is what has kept Jessica Marxen, 33, a programmer from Randallstown, Md., coming back to watch for the “Poe Toaster” for years. She and her sister Jeannette, 31, an administrative assistant, got involved after Jerome visited their high school and recruited them as volunteers at the Poe House. Though she has watched for the “Poe Toaster” for years, Jessica Marxen said she wouldn’t want to know who he is. Poe, who was born in Boston, lived in Baltimore, London, New York, Philadelphia and Richmond, Va. During a visit to Baltimore in 1849, he died under mysterious circumstances at age 40. The cause of his death has been the subject of much speculation over the years, with theories ranging from murder to rabies. Poe was buried in his grandfather’s lot in Westminster Burial Ground, in what is now downtown Baltimore. In 1875, his body and that of his aunt and mother-in-law Maria Clemm were moved to a prominent spot by the entrance with a memorial marker. The body of his young wife and cousin, Virginia, was exhumed and reburied with him 10 years later. Baltimore recently cut funding for the museum at the rowhouse where Poe lived with relatives from 1832 to 1835, before he found fame as a writer. It must close if it does not become self-sustaining by June. The annual graveside tribute was first mentioned in print in 1950 as an aside in an article that appeared in The Evening Sun of Baltimore about an effort to restore the cemetery, Jerome said. When Jerome spoke to older members of the congregation that once worshiped at the church, they recalled hearing about a visitor in the 1930s. The visitor has occasionally left notes with his tributes, but they haven’t offered much insight into the identity of the “Poe Toaster.” A few indicated the tradition passed to a new generation before the original visitor’s death in the 1990s, and some even mentioned the Iraq War and Baltimore Ravens football team, which was named for Poe’s poem. The vigil inside the former church is closed to the public, but over the years, a crowd has gathered outside the gates to watch. After the “Poe Toaster” failed to show in 2010, last year’s vigil attracted impersonators, including a man who arrived in a limo and a few women. The crowd outside the gates of the burial ground into Thursday morning was more respectful than last year. Even the impersonators were more solemn, perhaps because of the sense that this could be the last vigil, according to Sherri Weaver, 40, of Randallstown, who works in finance. Weaver and a few dozen others — some from as far away as California and Chicago — braved a windy night with temperatures around 30 degrees, hoping to catch a glimpse of the mystery visitor. Arguing that a well-rounded education is good for a Christian, St. Clement of Alexandria tells us that there are many ways of looking for truth. But the only way to find the whole truth is in Christ. When many men drag the ship down to the water, we can’t call them many causes, but one cause made up of many. For each man by himself is not the cause of the ship’s being dragged, but along with the rest. In the same way, philosophy, the search for truth, contributes to our understanding truth. It is not the cause of our understanding, but it is a cause along with other things—a cooperator, perhaps a joint cause. The different virtues are causes of happiness in one person; the sun, a fire, a bath, and clothing are the causes of our getting warm. So there is one truth, but many things contribute to investigating it. But we find it by the Son. In ancient times as well as our own, people brought forward supposedly scientific arguments against the resurrection. 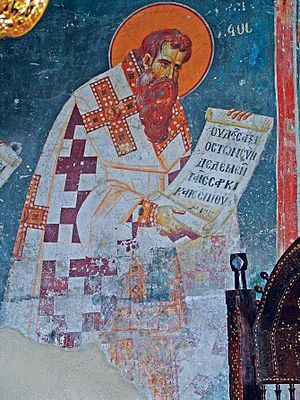 St. Gregory of Nyssa answers them: don’t judge God’s capabilities by your own. Because human reason is so weak, there are some who—judging divine power by the limits of our own—insist that what is beyond our capacity is impossible even for God. They point to the fact that the dead of past ages have disappeared, and to the ashes of those who have been cremated. They bring up the idea of carnivorous animals, and the fish that consumes the body of the shipwrecked sailor—the fish then becoming food for people, and passing by digestion into the mass of the one who eats it. They bring up many similarly trivial things to overthrow the doctrine of the resurrection—as though God could not restore man the way he made him in the first place. But we make quick work of their convoluted logical foolishness by acknowledging that the body does indeed dissolve into the parts it was made of. Not only does earth return to earth, as God’s word says, but air and water also revert to the like element. Each of our parts returns to the elements it was made from. But although the human body may be scattered among vultures, or the most savage beasts, by becoming their food; and although it may pass through the teeth of fish; and although it may be changed by fire into smoke and dust—wherever you may suppose, for the sake of argument, the man has been removed, he certainly remains in the world. And the world, as the voice of inspiration tells us, is held by the hand of God. If you, then, know what is in your hand, do you suppose that God’s knowledge is weaker than your own power? Do you suppose that it would fail to discover the smallest things that are in the palm of God’s hand? Happy Epiphany! In the United States and most other countries, the celebration of Epiphany has been transferred to this Sunday, but there are good reasons to continue to celebrate it on your own on January 6, and I’ll discuss some of those tonight at 7 P.M. EST on Catholic Answers Live. I hope you’ll tune in and even call in–I can’t wait to talk to you! Pope Benedict XVI’s prayer intentions for January 2012 remind us that the lessons of the Christmas season must extend throughout the year and recall the Church’s dedication of the month of January to the Holy Name of Jesus. The world is a work of art displayed for our admiration, says St. Basil. When Genesis says, “In the beginning God created the heaven and the earth,” it tells us that the world is a work of art, and it tells us who the artist is. Among the arts, some have production in view, some practice, others theory. The object of the last is to exercise thought; of the second, the motion of the body. If it ceases, everything stops—there’s nothing more to see. Thus dancing and music leave nothing behind: they have no object but themselves. In creative arts, on the other hand, the work lasts after the operation. Such is architecture; such are the arts that work in wood, brass, and weaving, and in fact every art that, even when the artist is gone, shows an industrious intelligence, and causes the architect, the brasier, or the weaver to be admired for his work.